THE PLAN. Watching a plane’s wings detach isn’t something you want to see in today’s air travel. But that just might be where airplanes are headed, according to one tech CEO. French entrepreneur Maurice Ricci is the CEO of Akka Technologies, and he has a pretty unique vision for the future of airplanes. And it happens to have a lot in common with the future of trains. He thinks combining the two modes of transportation — creating a plane that can travel on the ground via tracks / a train that can fly through the air — will improve the passenger experience. 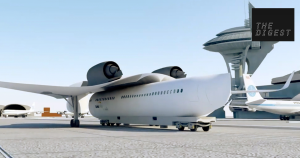 According to an interview with Bloomberg, he even got a chance to pitch his flying train concept to Boeing, one of the biggest names in air travel. THE PLANE. Akka calls the plane/train hybrid Link & Fly. Late last year, it released a digitally rendered video of the concept in action. With its wings attached, the craft doesn’t look all that different from the planes soaring in and out of today’s airports. The primary difference is that the wings connect to one another over the plane’s cylindrical body, rather than connecting to each side of the plane separately. Once on the ground, the body of the flying train separates from those wings and the cockpit, dropping onto a platform positioned on tracks. It’s then free to ride the rails. According to the Bloomberg report, passengers would board and disembark the craft at train stations, so they wouldn’t have to find alternate ways to travel to and from airports. THE PURPOSE. Akka might not be a household name, but the company is growing — just this year, its stock increased by 23 percent. It’s also been dabbling in forward-thinking transportation tech for more than a decade now. It had a concept for an autonomous car back in 2008 — a time when the idea was just starting to really seem viable. In March, it announced a partnership with Microsoft and ICONIQ MOTORS to design an car capable of Level 5 autonomy by 2020. A few months later, it acquired PDS Tech, a staffing agency that connects big-names in the aerospace industry with engineering and R&D talent. One of those big-names? Boeing. You probably won’t be able to hop aboard one of Akka’s futuristic planes any time soon, though. According to the Bloomberg piece, the company “[isn’t] banking on convincing a plane maker to necessarily build the entire ‘Link & Fly’ concept,” though Ricci does believe bits and pieces of the design might find their way into commercial aircraft in the future. So the purpose behind this flying train video and pitch, then, is probably to draw attention to the company. And in that, they appear to have been successful.